Burma liveaboard dive trips depart from and return to Thailand, usually Phuket, Khao Lak or Ranong. There is normally a short stop at Kauwtaung (Victoria Point) where immigration proceedures are taken care of. During this time guests can disembark the boats to explore the small town’s streets or walk up to the temple overlooking the harbour. It is a chance to buy cheap Burmese rum and cigarettes among other things. Your liveaboard operator will usually sort out the necessary entry paperwork for you as long as you provide them with passport copies. There is a fee payable on the boat for Mergui archipelago entry which depends on the length of the trip but is around US$150-250 per person. You should have crisp new US$ bills with you as it is not possible to change money in Kawthaung. You will need your passport plus 3 copies of your passport’s face page and 3 copies of the Thailand entry stamp page. You will also need 4 passport size photos. 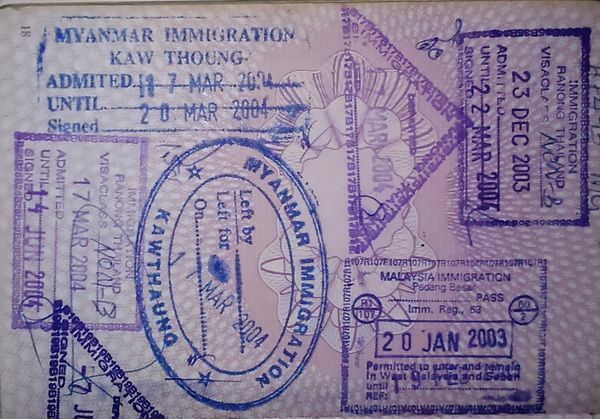 Note that the Mergui entry fee is not a Myanmar visa fee. Divers and dive boats enter Mergui waters under a special agreement with the Myanmar authorities. If you already have a visa to enter Myanmar you will still need to pay the Mergui entry fee. Once in Myanmar territorial waters you will rarely disembark the dive boat except maybe for a BBQ on a deserted beach or to visit a Moken village. Each liveaboard is issued with a government provided “guide” who makes sure that your boat stays in the designated diving areas only. You cannot stay in Myanmar after your trip to continue your travels in Burma. You must re-enter Thailand on your liveaboard and then go back to Burma with the correct visa. Most tourists can enter Thailand and receive a “entry on arrival” visa stamp. If you arrive by air you get a stamp that lasts for a single 30 day entry. If you arrive overland you stamp will be for 15 days only. When you exit Thailand at Ranong immigration to enter Myanmar on your liveaboard trip you will be stamped out of Thailand and on re-entry after the liveaboard trip you will be issued with a new 15 day single entry stamp. If your country does not qualify for “visa on arrival” or if you plan to stay in Thailand for longer than 15 days after the liveaboard you should apply in advance to your local Thai embassy for a multiple entry visa. Most of the Burma liveaboards include some diving in Thai waters around Similan and Surin. In this case Marine national park fees are required. Currently (2013-14 season) the rates are 500 baht entry to the park plus 200 baht per diving day for foreigners. As your trip will depart from Thailand you can get detailed Thailand Tourist Information here. Some advocacy groups still discourage tourism to Burma which receives severe international critisism for it’s human rights records. However with Myanmar’s recent opening up to the world and with the release from house arrest in 2010 and admission into parliament in 2012 of pro democracy campaigner Aung San Suu Kyi, tourism is now promoted as a method of providing economic benefit to Burmese civilians without isolating the country from the rest of the world. Liveaboard diving in the Mergui Archipelago is a perfect example of small scale responsible tourism and over the last 15 years or so we have seen how tourism cash into Kawthaung (Victoria Point) has improved the quality of life for the Burmese living there.